Terrapin's first Gose, this beer is kettle soured with Lactobacillus for a tart, but refreshing beer. 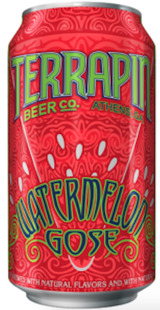 Watermelon aroma and flavor is complemented with a distinct lactic tartness and saltiness that is true to style. Perfect for a hot summer day, this beer will blow any picnic out of the water…. melon! Pairings: Fresh Chevre or Camembert, Grilled oysters with garlic & paprika, Juicy, briny and delicious with a bowl of watermelon, feta, basil and balsamic salad on the side.